Subcutaneous sarcoidosis (also known as ‘Darier-Roussy sarcoidosis’) is a rare subcutaneous form of sarcoidosis, occurring in 1.4 to six percent of patients with sarcoidosis. 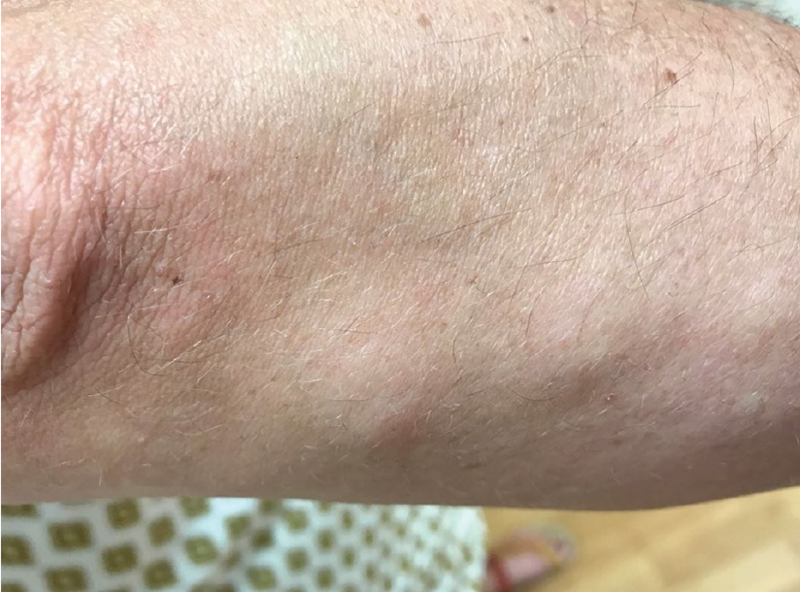 It is characterized by firm, asymptomatic to slightly tender, red or skin-colored nodules located on the trunk and extremities.1 We report a case of a 55-year-old female who had a complaint of “systemic illness” for five months. Pathology slides revealed non-necrotizing subcutaneous sarcoidal granulomatous dermatitis consistent with subcutaneous sarcoidosis. Figure 1: Tender mobile subcutaneous nodules in the distal right forearm. Figure 2. 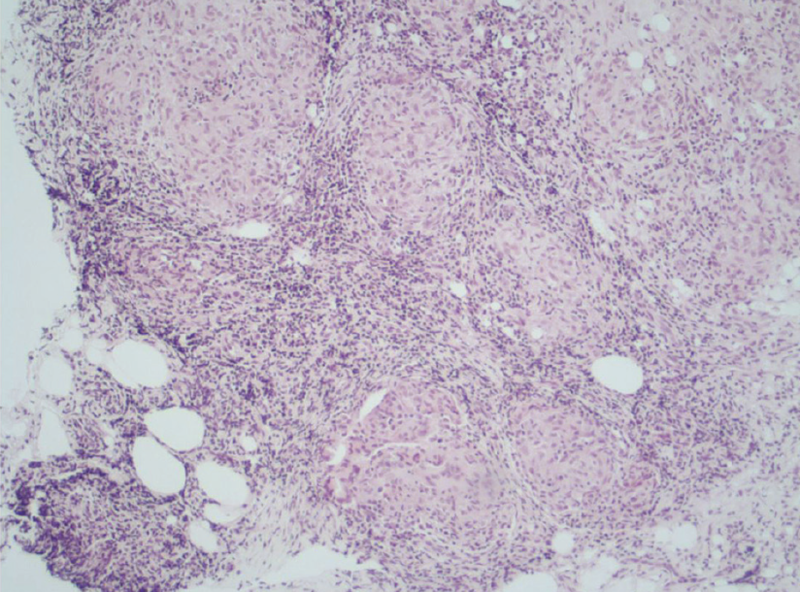 (4X magnification) A low power view reveals subcutaneous tissue with a dense proliferation of non·caseating granulomata associated with a mixed small cell inflammatory infiltrate. Figure 3. (10x magnification) A higher power view highlights the non-caseating granulomata with epithelioid histiocytes having eosinophilic cytoplasms and associated with a mixed infiltrate of lymphocytes, plasma cells and rare eosinophils and multinucleated giant cells. Figure 4. (40x magnification) An even higher power view demonstrates more clearly the non-caseating granulomata composed of epithelioid histiocytes and rimmed by lymphocytes, plasma cells and rare eosinophils. Ms. J.P. presented to rheumatology service with chief complaint of “systemic illness” lasting five months in June 2017. She reports that since January 2017, she had experienced “stiffness” in both lower extremities upon transitioning from a seated to a standing position and intermittent activity-related right posterior thigh pain. By mid February, she noted increased sleeping requirements from her normal six hours to about hour hours per night in addition to having “waves” of generalized arthralgia and myalgia. In April, while traveling, she fell, contusing her left pretibial surface, both prepatellar surfaces, and her right forearm whereupon she developed mildly painful, nonecchymotic nodules over the contusion sites. At the same time, she developed painless edema and erythema of her left distal leg. She was diagnosed with “cellulitis” and treated with antibiotics (trimethoprim-sulfamethoxazole) without benefit and, subsequently, with a second course of antibiotics (cephalexin)—also without benefit. Throughout May 2017 and until her first appointment in June 2017, she developed multiple subcutaneous slightly pruritic, nodular densities over both forearms. She described the sensation in both forearms as if they were “bruised.” She had one of these densities biopsied at a plastic surgery clinic on May 24, 2017 with initial biopsy interpretation as: fibroadipose tissue with non-necrotizing granulomatous inflammation. The differential diagnosis considered at that time was: mycobacteria tuberculosis (TB), fungi, antineutrophil cytpoplasmic antibodies (ANCA) positive vasculitis and sarcoidosis. Multiple studies ordered by the rheumatologist at that time included (Chest X-ray (CXR), ANCA, angiotensin-converting enzyme (ACE) levels, basic metabolic panel (BMET), C-reactive protein, complete blood count with differential, complement studies, creatine kinase, erythrocyte sedimentation rate, Hepatitis (Hep) B core AB, Hep B surface AG, Hep B surface AB, Hep C, liver panel, thyroid-stimulating hormone, Quantiferon Gold. All labs were found to be normal except for an abnormally high ACE level of 69 as well as elevated serum glutamic oxaloacetic transaminase (SGOT): 45, and serum glutamic pyruvic transaminase (SGPT): 58. Due to these findings and, despite a normal CXR, the diagnosis of sarcoidosis was favored. A subsequent chest computerized tomography (CT) scan confirmed bilateral hilar adenopathy and consult to the dermatologist raised the possibility of an unusual form of sarcoidosis—namely subcutaneous sarcoidosis or the Darier-Roussy subtype of sarcoidosis. Additional review of the pathology slides by the dermatopathologist revealed non-necrotizing subcutaneous sarcoidal granulomatous dermatitis consistent with subcutaneous sarcoidosis (Darier-Roussy type). The first case of subcutaneous sarcoidosis was published in 1904 by Darier and Roussy. 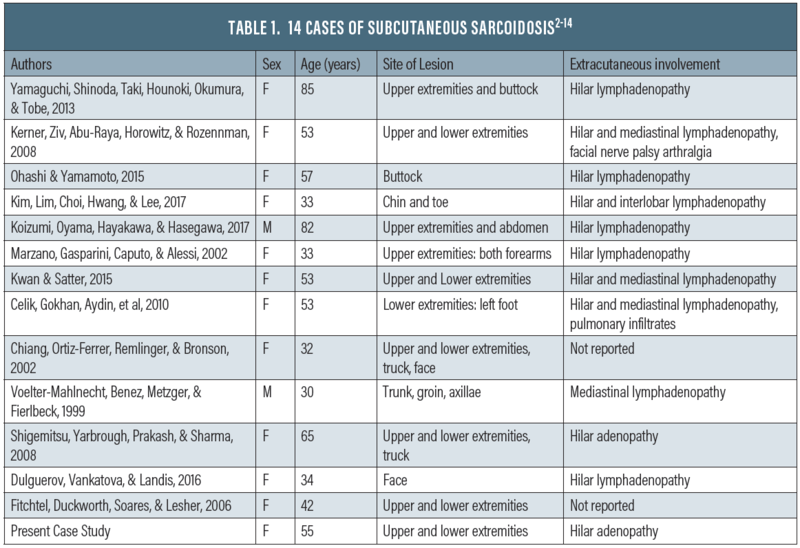 Few cases of subcutaneous sarcoidosis have been reported in the last 20 years. Table 1 shows 14 cases reported in literature from 1999 to 2017. Of these patients, 12 were female and two were male, with a mean age of 48. The only race reported was Caucasian; however, most of the case reports did not specify the race of the patient. Patients with subcutaneous sarcoidosis most commonly have bilateral hilar lymphadenopathy with or without mediastinal adenopathy.9 In a majority of patients, a CT scan or an X-ray was used to examine bilateral hilar, mediastinal lymphadenopathy or hilar adenopathy. 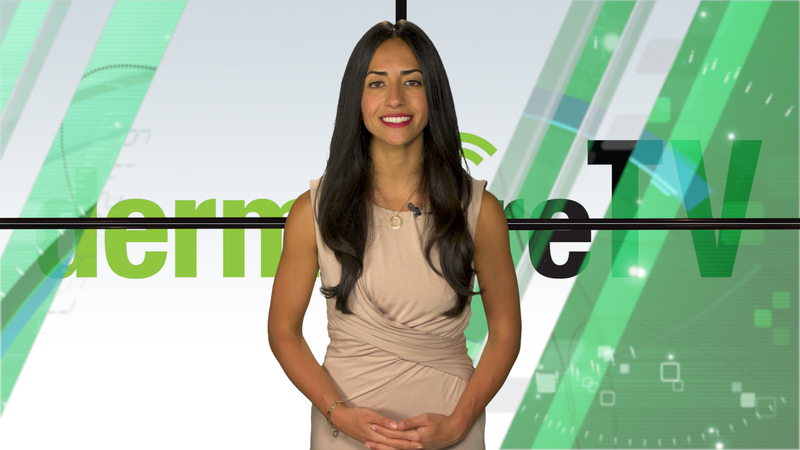 Serum levels of angiotensin-converting enzyme (ACE) were elevated in 10 patients. Our patient had elevated ACE levels and bilateral hilar adenopathy. Subcutaneous sarcoidosis is closely associated with systemic manifestations, such as lung involvement, uveitis, lymphadenopathy, arthritis, mucositis, dactylitis, neurological and renal involvement, and hepatosplenomegaly.4 The severity of the systemic disease determines the necessary treatment. Subcutaneous sarcoidosis does not always require treatment; some cases have reported spontaneous regression of the lesions. Spontaneous regression of lesions usually happens in patients that do not have systemic symptoms. The cases with patients who have systemic symptoms have reported using oral corticosteroids as an effective form of treatment. Alternative forms of treatment such as methotrexate, hydroxychloroquine, and allopurinol have been reported with varied success in patients who do not tolerate corticosteroids.12 Often spontaneous remissions occur; hence, it is essential that the patient still receive treatment even after the lesions and systemic symptoms have dissipated. Early diagnosis is important for effective treatment and to ensure systemic symptoms do not get too severe. More research needs to be conducted on subcutaneous sarcoidosis to find the etiology and treatment options that are successful with minimal chance of reoccurrence. The authors have no financial conflicts of interest to disclose. John Pujals, MD is a board-certified dermatologist and fellowship-trained dermatopathologist at Forefront Dermatology in Neenah, WI. Victoria Negrete, MD is a board-certified dermatologist at Forefront Dermatology in Neenah, WI and Gabrielle Kartzmark, BS is an undergraduate student at the University of South Carolina. The authors have no financial conflicts of interest to disclose. 1. Marcoval J, Moreno A, Mana J, Peer J. Subcutaneous Sarcoidosis. ClinicalKey. https://www-clinicalkey-com.pallas2.tcl.sc.edu/#!/content/playContent/1-s2.0-S0733863508000430?returnurl=https://linkinghub.elsevier.com/retrieve/pii/S0733863508000430?showall=true&referrer=. Published 2008. Accessed March 9, 2018. 2. Yamaguchi S, Shinoda K, Taki H, Hounoki H, Okumura M, Tobe K. Systemic Sarcoidosis with Subcutaneous Lesions in an 85‐Year‐Old Female. Proxy Login - University Libraries - USC. https://onlinelibrary-wiley-com.pallas2.tcl.sc.edu/doi/full/10.1111/jgs.12109. Published February 13, 2013. Accessed March 20, 2018. 3. Kerner M, Ziv M, Abu-Raya F, Horowitz E, Rozenman D. Subcutaneous Sarcoidosis with Neurological Involvement: An Unusual Combination. Israel Medical Association Journal. https://www.ima.org.il/FilesUpload/IMAJ/0/44/22026.pdf. Published June 10, 2008. Accessed March 9, 2018. 4. Ohashi T, Yamamoto T. Subcutaneous Sarcoidosis with Underlying Intramuscular Granuloma. Indian Journal of Dermatology. https://www.ncbi.nlm.nih.gov/pmc/articles/PMC4318048/. Published 2015. Accessed March 20, 2018. 5. Kim KS, Lim DS, Choi JH, Hwang JH, Lee SY. A Case of Subcutaneous Sarcoidosis Occurring along the Superficial Veins of the Forearms: A Distinctive Cutaneous Manifestation Masquerading Venous Tropic Action in the Underlying Systemic Disease? Archives of Craniofacial Surgery. https://www.ncbi.nlm.nih.gov/pmc/articles/PMC5647841/. Published September 26, 2017. Accessed March 23, 2018. 7. 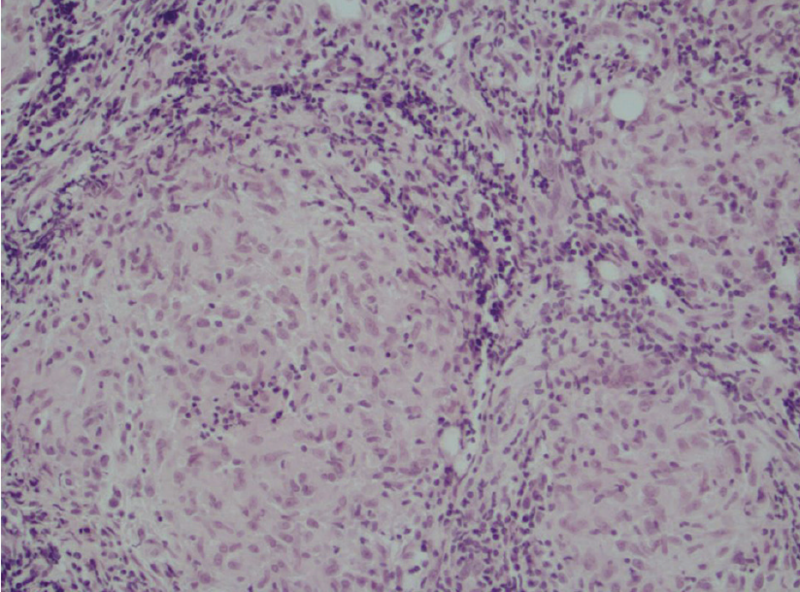 Marzano A, Gasparini G, Caputo R, Alessi E. Subcutaneous sarcoidosis following hypophysectomy for pituitary microadenoma inducing Cushing’s disease. Proxy Login - University Libraries - USC. https://onlinelibrary-wiley-com.pallas2.tcl.sc.edu/doi/full/10.1046/j.1365-4362.1998.00525.x. Published January 5, 2002. Accessed March 25, 2018. 9. Celik, Gokhan, Aydin, et al. Subcutaneous Sarcoidosis with Plantar Involvement. Annals of Dermatology. https://anndermatol.org/DOIx.php?id=10.5021/ad.2010.22.4.435. Published November 5, 2010. Accessed March 25, 2018. 10. Chiang JK, Ortiz-Ferrer LC, Remlinger K, Bronson DM. Subcutaneous Nodules in a Patient With Hydrocephalus. Jama Network. https://jamanetwork-com.pallas2.tcl.sc.edu/journals/jamadermatology/fullarticle/478684. Published February 2002. Accessed March 26, 2018. 11. Voelter-Mahlknecht S, Benez A, Metzger S, Fierlbeck G. Treatment of Subcutaneous Sarcoidosis With Allopurinol. Jama Network. https://jamanetwork-com.pallas2.tcl.sc.edu/journals/jamadermatology/fullarticle/478113. Published December 1999. Accessed March 25, 2018. 12. Shigemitsu H, Yarbrough CA, Prakash S, Sharma OP. 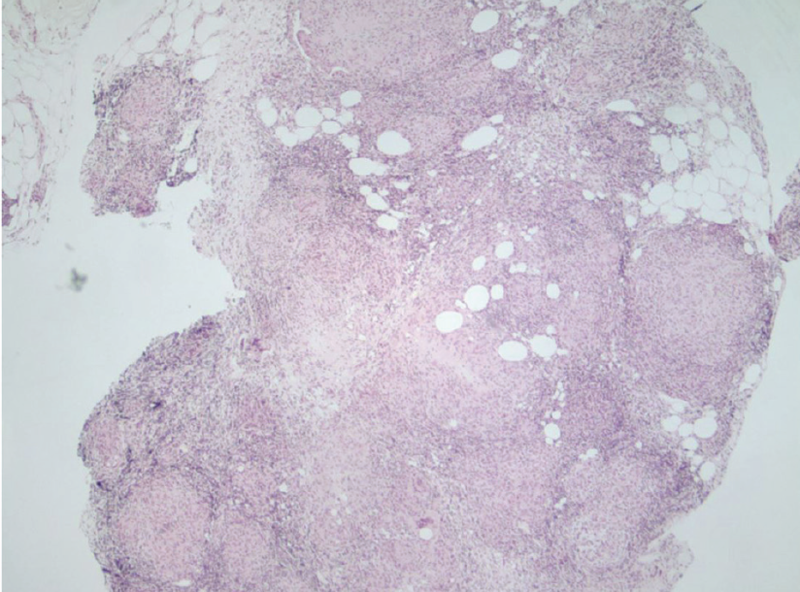 A 65-Year-Old Woman With Subcutaneous Nodule and Hilar Adenopathy. Chest Journal. http://journal.chestnet.org.pallas2.tcl.sc.edu/article/S0012-3692(08)60374-8/fulltext. Published November 2008. Accessed March 25, 2018. 14. Fichtel JC, Duckworth AKW, Soares T, Lesher JL. Subcutaneous sarcoidosis presenting after treatment of Cushing’s disease. 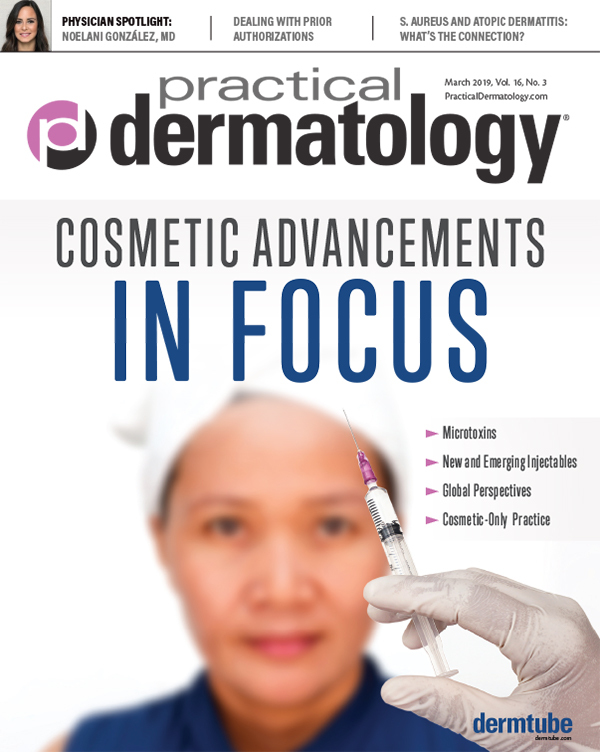 Journal of the American Academy of Dermatology. http://www.jaad.org/article/S0190-9622(05)00996-5/fulltext. Published February 2006. Accessed March 9, 2018. Gabrielle Kartzmark, BS is an undergraduate student at the University of South Carolina. Victoria Negrete, MD is a board-certified dermatologist at Forefront Dermatology in Neenah, WI. John Pujals, MD is a board-certified dermatologist and fellowship-trained dermatopathologist at Forefront Dermatology in Neenah, WI.